I’ve poked fun at Paul’s dinner plate of color before: beige potatoes, beige fish and corn. As for me I eat with my eyes and vibrant colors stimulate my appetite in anticipation of a tasty meal ahead. Admittedly throughout the years, I’ve acknowledged and accepted beige into my world, primarily in the realm of stewed chicken and dumplings. It’s the perfect cool night dish that we only eat when it’s cold outside and need something to warm our bellies. I’ve posted this recipe before but in an effort to activate all the senses mentioned above, I’ve changed it quite a bit to Paul’s dismay. Instead of using one chopped carrot, I’ve included three. Yes, shocker I know. With the addition of two celery stalks (instead of one) that’s all the color the recipe has. Preparation starts the day before with placing pieces from a whole chicken in a large stock pot with water barely covering the chicken, along with the celery, carrots, peppercorns and salt. It cooks for 3-4 hours until the chicken falls apart from the bones. 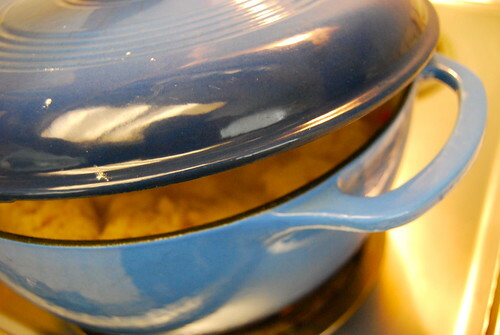 The stock pot — chicken and all — is then placed into the refrigerator overnight. Now comes the hard part: separating the chicken fat from the broth and removing the bones and fat from the chicken. This could be done after the chicken has cooled somewhat after the initial round. But placing it in the refrigerator and letting the fat solidify and rise to the top makes the process so much easier. It’s gravy making time. Take into account the amount of broth left over after the chicken has been removed. For each cup of broth left over, place a tablespoon of chicken fat and a tablespoon of flour into a large pot or dutch oven and combine until it forms a thick gravy. 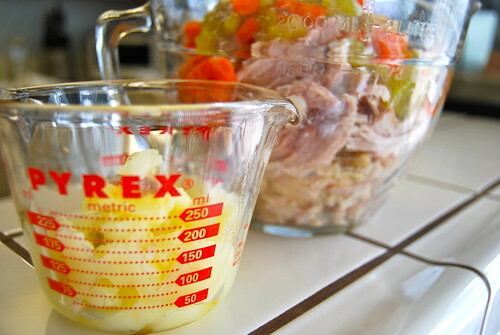 A regular recipe yields approximately 3-4 cups of chicken broth. Add the broth and heat over medium for 10 minutes. Add chicken, carrots and celery. Bring it to a boil. 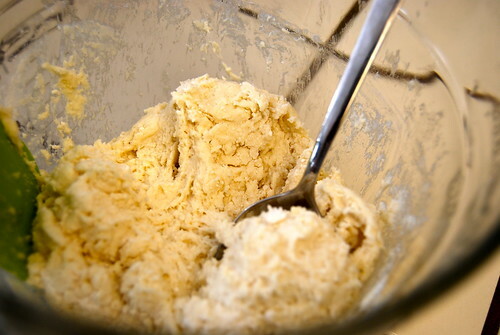 Make dumplings with Bisquick and milk until a soft dough forms. When the stew comes to a boil, add the dumpling mixture into the pot via spoonfuls. Top with lid and let dumplings steam for 12-15 minutes. Don’t peek! You can substitute Spatzel for dumplings. 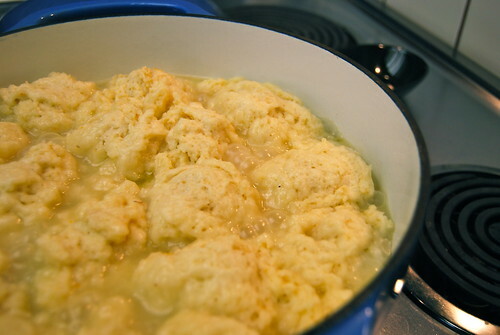 Or, if you’re against using Bisquick, you can make your own dumplings from scratch. This recipe is great for a cold winter night — even if it is “cold” by San Diego standards. Barely cover the chicken with water. Add all the seasonings, including the celery and carrot. Heat to simmering, cover and simmer gently until meat is tender, about 3-4 hours. Refrigerate for a few hours or overnight. 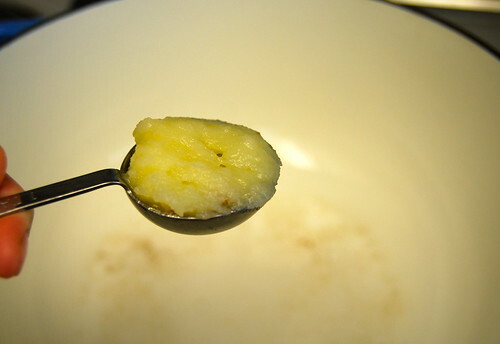 Skim the fat from the top and reserve for later. Take the meat from the broth and remove all skin and bones. Discard. Strain the broth and thicken for gravy. 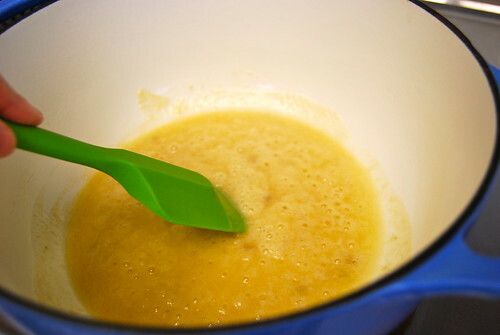 Blend 1 tablespoon of flour and 1 tablespoon of fat for each cup of broth. Blend into broth. 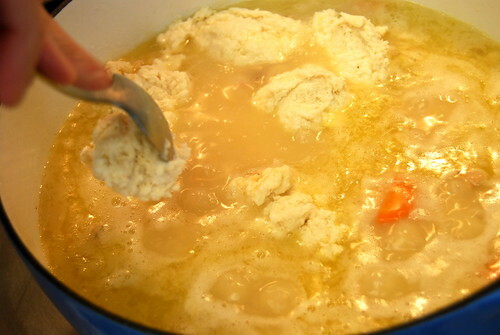 Return the chicken to the hot gravy and drop in dumplings (recipe for 10-14 large dumplings follows). Shift together the flour, baking powder and salt. Cut in butter until crumbly. Add milk gradually. Drop by spoonfuls on top of meat and inch apart and cover tightly. Steam for 12-15 minutes. Combine Bisquick and milk until soft dough forms. Drop by spoonfuls on top of meat and inch apart and cover tightly. Steam for 12-15 minutes. Yummy. I didn’t take any photos of my chicken & dumplings yesterday. Mine had no color. There were no carrots or celery to be had so I used potatoes and corn for my veggies. It was indeed very beige but still quite tasty. 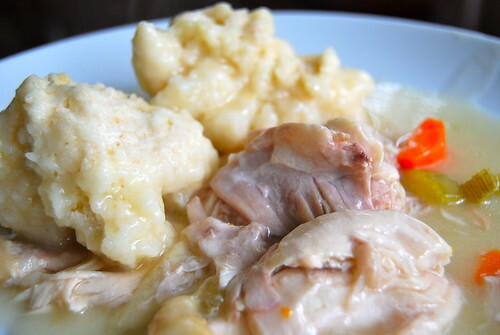 Chicken and dumplings are my favorite cold weather food! With your addition of potatoes and corn, it’s almost like a pot pie. i LOVE chicken and dumplings. talk about total comfort food. brings back memories of rainy san diego weather and mom in the kitchen making this dish for us (with the Bisquick dumplings!). mom would also add carrots and occasionally, potatoes too. yum. now i’m in the mood for this. … and, yippee! i have chicken thawing in the fridge today too! Bisquick dumplings are delicious. So fast and easy! I have a love/hate relationship with Pinterest. I initially had the ability to have people pin my photos but notice that graphics/comics created by my me and my husband were being pinned without proper attribution so I protected all my images. If I could protect only the graphics, I would but it’s all or nothing with the rights protection.